When you call on us for emergency septic services in Eustis, you will find that we provide the solutions you need right away. No one ever wants to deal with a septic emergency, but when one does occur, knowing who to call is the most important step. 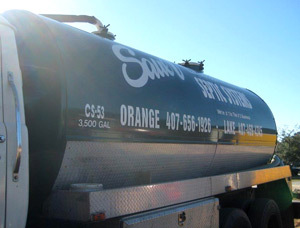 At Sauer Septic, we have more than 30 years of experience providing emergency septic services for our customers in Eustis, Florida, and you can always rely on us for the rapid response needed to address this serious problem. While it may be tempting to just leave a septic problem until the morning, often it’s better not to wait. When you call on us for emergency septic services, you will find that we provide the solutions you need right away. Quick – Having raw sewage backing up into your bathtub or a sewer line break in your yard is never ideal and always unsanitary. When you call on our professionals, we’ll act quickly to resolve the issue and make sure your home or business is safe. Quality – Just because we act fast doesn’t mean you’ll experience anything less than expert solutions and quality customer service. We understand that calling for emergency septic services can be stressful, and we’ll do everything we can to help you achieve greater peace of mind. Comfort – Once our emergency septic services are finished, we won’t simply leave you until the next emergency rolls around. We’ll make sure you feel comfortable with the services we have provided and that you know you can rely on us for all your future septic system servicing needs. If you have questions about our services or you are experiencing a septic problem, you’ll find our team at Sauer Septic ready and available to provide the emergency septic services you require. Contact us today!